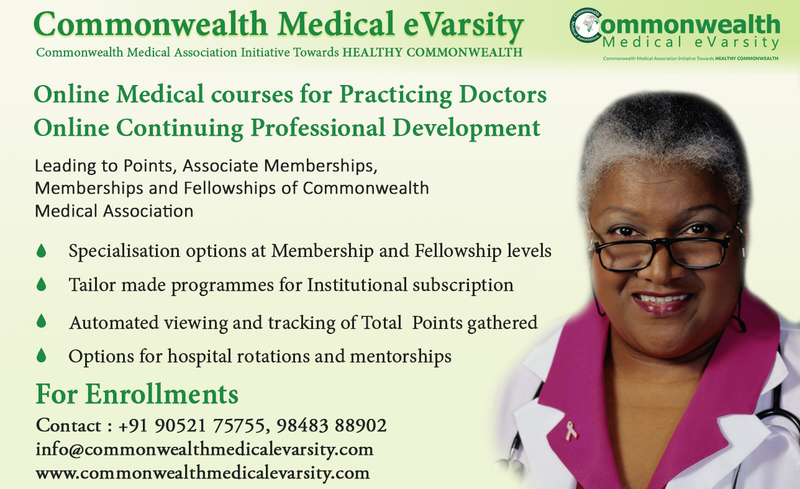 The Commonwealth Medical eVarsity is an initiative of the Commonwealth Medical Association to promote continuous medical education among its members and offer and distribute online medical courses. The Commonwealth Medical eVarsity is a virtual university that offers online education to medical graduates through an interactive medium of education taking leaf from the best practices of distance education from across the Globe. The Commonwealth Medical eVarsity is a joint educational outreach venture, promoted by the Commonwealth Medical Association, and Service provided by Commonwealth Medical eVarsity Pvt. Ltd. that strives to bring the classroom to the Doctor’s home and clinic. The Commonwealth Medical Association was established in 1952. The Association, also known as the CMA, is a non-governmental organization and its main objective is to assist and strengthen the capacities of national medical associations (NMAs) of countries within the Commonwealth to improve the health, well-being and human rights of their countries and communities. The main aim of the CMA is to assist and strengthen the capacities of National Medical Associations of countries within the Commonwealth to improve the health and well-being of their communities and countries. Activities: Regional and international workshops on health issues; medical and health research; advocacy on health issues; capacity-building for member national medical associations; and collaborations with other international bodies, civil society and governance institutions, with similar objectives. Embracing the ease, availability, flexibility, and rapidly evolving sophistication of ICT in today’s world, its adoption for the administration of a blended learning approach for CPD, is happening now. All members are welcomed to this far-reaching Initiative.